The City of Reed City has some beautiful parks and trails. Check out what each park has to offer. There is something to be enjoyed by all ages! Rambadt Park is a 33-acre community park containing a unique blend of diverse natural areas, and active use development consisting of 13 campsites, a play area, trails, a performance pavilion, and camper activity areas. It is located in the northern portion of the City near the southwest corner of US-10 and Old US-131. 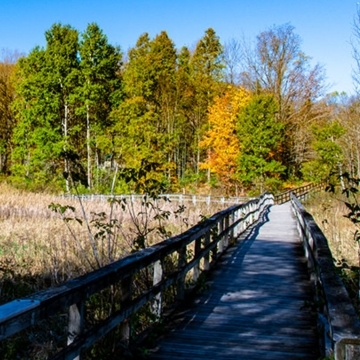 It contains a nature trail through the surrounding wooded area to the Old Rugged Cross Historical Museum, and it also connects to Linear Park, which winds along the Hersey River, and crosses it with the “Little Mac” bridge to Recreation Park, and eventually to the Pere Marquette Trail. It is open from May 1st through October 30th. In addition to the trails and natural areas, Rambadt Park contains 12 campsites with electricity and water hookups, a sanitary station, restrooms with showers, a playground area, horseshoe pit, picnic pavilion, and a band shell. Spaces on a first come/first serve basis. There are free concerts in the park every Friday night, June through August. 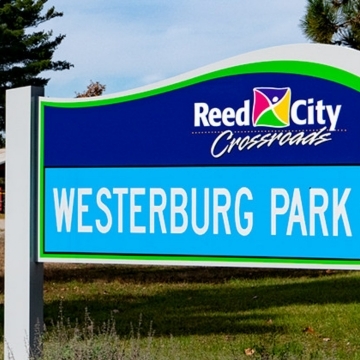 Westerburg Park is a large 46-acre community park that serves the entire City and surrounding townships. It is a unique blend containing both natural areas and sports facilities, and is the home of many community events. It is the primary ball complex in the region. The Hersey River runs through the park and offers trails, fishing, and nature observation. Westerburg is important to both City and Township residents alike. Volunteer groups are very actively involved in the operation, maintenance, and coordination for regular and special events in this park. Westerburg Park contains basketball courts, baseball/softball diamonds, 2 picnic pavilions, Hersey River fishing access, and playground area. Linear Park is the name for the parcel containing the Memorial Walkway which runs along the Hersey River and links Rambadt Park to Westerburg Park. There is an open-air gazebo and seating, as well as the Little Mac Bridge and a tribute to the Boy Scouts. 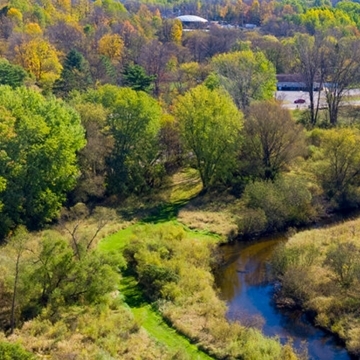 Linear Park is also intersected by the White Pine Trail State Park, which ultimately connects Grand Rapids to Cadillac. 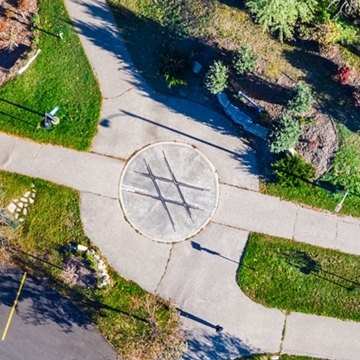 Depot-Crossroads Park is an urban park associated with the historic Reed City Train Depot and railroad “Crossroads.” The Park is intersected by the regional White Pine Trail State Park heading north and south and the Pere Marquette State Trail heading east and west. The Park primarily serves residents of the City in the spring and fall; however, the park is used year-round by trail users from throughout the region on bikes and snowmobiles. The Water Tower Ball Field is a little league baseball field which is primarily used by City residents and the youth baseball program. 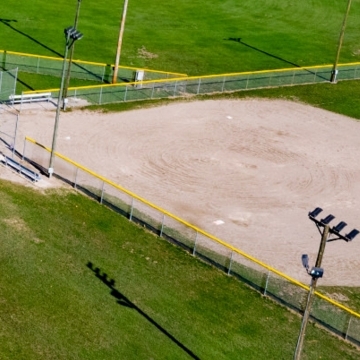 The facility contains fencing, bleachers, dugouts, and unpaved parking. The scheduling for the Gazebo and Park Pavilions are done through City Hall. You may schedule the gazebo or pavilions by calling City Hall at (231) 832-2245, writing us at 227 E. Lincoln, Reed City, MI 49677, or contacting us via e-mail. RAMBADT PARK: The rental fee for the pavilion is $50.00 for city residents and $75.00 for non-residents. No deposit is required upon reservation, but the fee does need to be paid prior to use. Reservation of the pavilion is for the entire day. There is electric, picnic tables, grills, trash containers, playground and restrooms available. You may have music, but need to be respectful of the other people in the park There is a Park Manager on site and is available if needed. Decorating of the pavilion is allowed, but you must remove all decorations when you are done at the park. WESTERBURG PARK: The rental fee for the pavilion is $50.00 for city residents and $75.00 for non-residents. No deposit is required upon reservation, but the fee does need to be paid prior to use. Reservation of the pavilion is for the entire day. There is electric, picnic tables, trash containers, playground and restrooms available. You may have music, but need to be respectful of the other people in the park Decorating of the pavilion is allowed, but you must remove all decorations when you are done at the park. GAZEBO: The rental fee for the gazebo is $10.00. No deposit is required upon reservation, but the fee does need to be paid prior to use. This site is rented for weddings and ceremonies only. Decorating of the gazebo is allowed, but you must remove all decorations when done with the gazebo. Chairs and tables used for the ceremony are permitted. There is no electric, rest rooms or trash containers there. Tents, portable restrooms and any receptions or open houses are not allowed at this site. There is minimal parking, but extra parking is available at Rambadt Park. Park Hours – City parks are open to the public between 8:00 a.m. and 10:00 p.m. Hunting and trapping of any animal in a City park is NOT permitted. No fires shall be built except in grills provided for that purpose. Dogs must be on a leash six ft. long or less at all times in any City park. No person shall permit any domestic animal to run at large. Animal droppings must be collected and removed. Loud music and disorderly conduct are prohibited. No person shall ride or drive in any City Park or playground except on proper roadways and shall not drive at a speed exceeding ten miles per hour. Persons using City Parks shall refrain from using profanity and/or offensive language.